Edinburgh is a weird city, as far as layout goes. It grew up in a strange way, and that makes it a downright puzzling city. 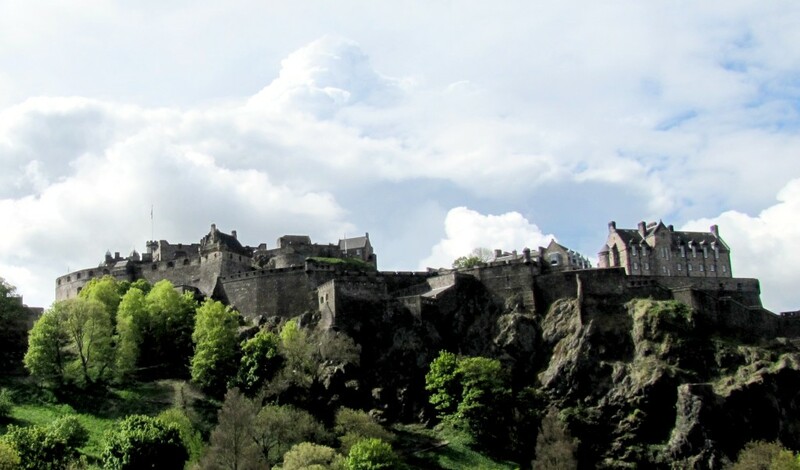 See, first of all, you’ve got the huge basalt mound upon which Castle Edinburgh sits1. The basalt was resistant to the flow of glaciers, which cut hugely deep gouges around it. 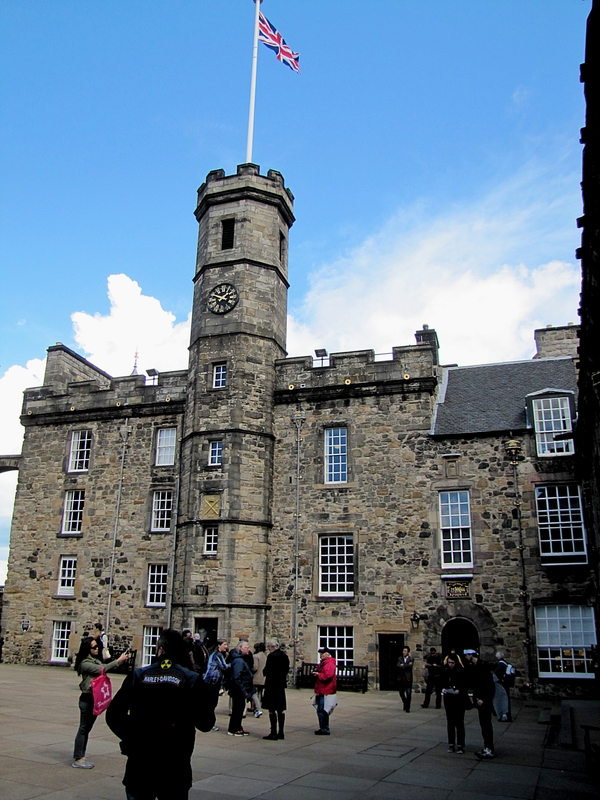 When the city grew up, it was Castle Edinburgh, and the Royal Mile, a single, mile-long with 50 or so Closes – tiny alleyways leading to off-street courtyards. 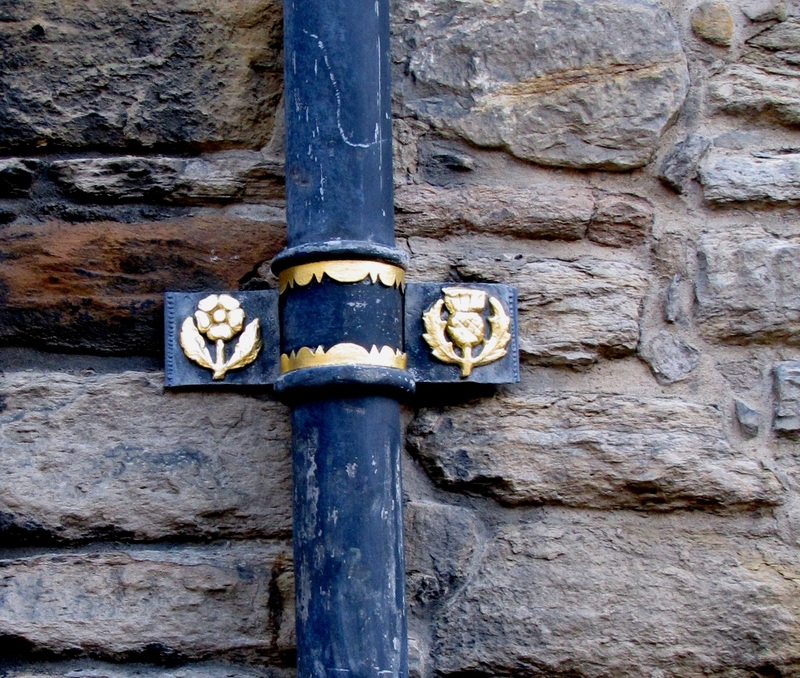 This ran directly down the hill from the castle to the city walls2. It wasn’t until the 1700s that the city started expanding, with the New Towns built3 around the old town. These new towns meant new streets and roads needed to be built, crossing over the huge rifts in the land, meaning bridges. The bridges were lined with houses and other buildings, so that they look like streets. This means that Edinburgh exists on several criss-crossing, levels, streets crossing over each other, with height differences in the range of 50-100 feet. And that makes it hard to find my way around, even with my map app. And Edinburgh Castle sits high above everything else. You can see it from pretty much anywhere in the city centre. And I thought York Minster loomed; it’s got nothing on this place. So, this morning, I walked down to Waverly Bridge, and caught the City Sightseeing bus. 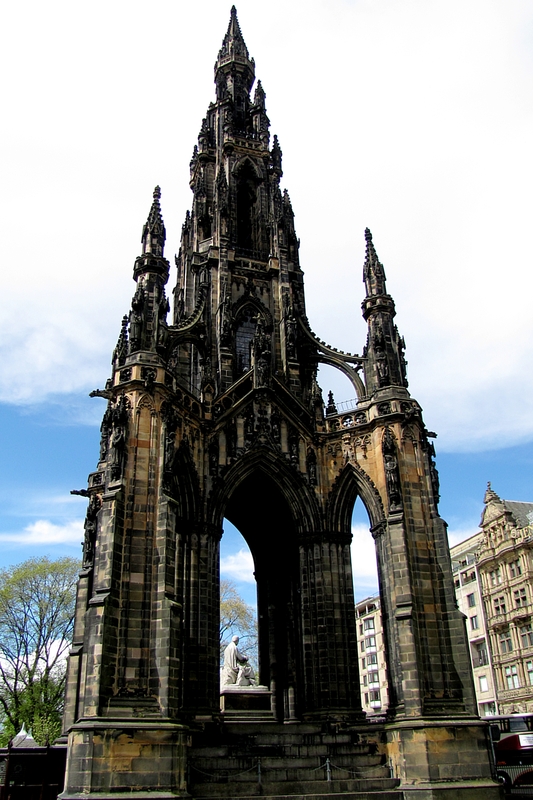 The Scott Monument is right near the bus stop. It’s a neat, medieval-style monument. Also, the architect who won the contest to design the monument was found face-down in a canal before it was finished. No one was convicted of killing him, but there WERE 54 other architects who might have been miffed. I rode the bus around the tour once, and got off when it started bucketing down rain at the end. I had a bit of lunch, then got back on, and rode it around to Castle Edinburgh. That’s where I spent the rest of the afternoon. The way up winds through the lower and middle wards, to the upper ward with the Royal Square. 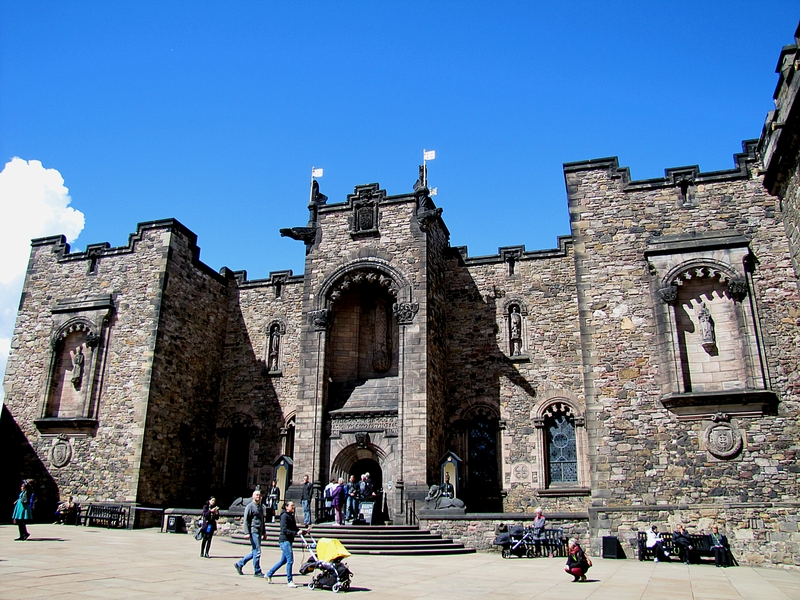 The square is surrounded by a building that holds the Crown Jewels, a banquet hall built by James IV for the wedding of his son and Mary of Guise, the older sister of Henry VIII. The decorations on the hall feature both the rose and the thistle, emblems of England and Scotland. There is a display of weapons in the great hall. 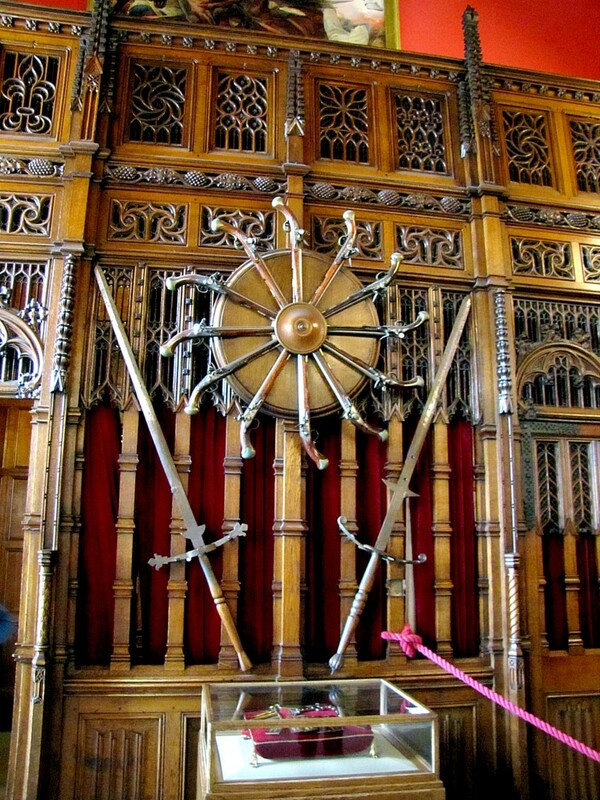 Here are some big swords, a bunch of pistols and, in the case below, the key to the castle. 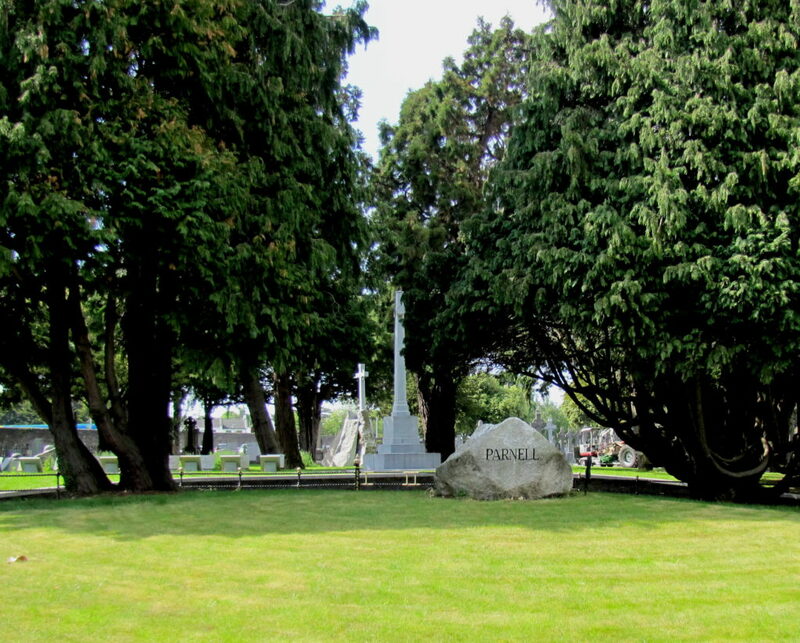 This is the War Memorial. No photography inside. But it’s a very moving, affecting place. The names of all Scots who have fallen in the line of duty are entered in memorial books, one for each regiment. 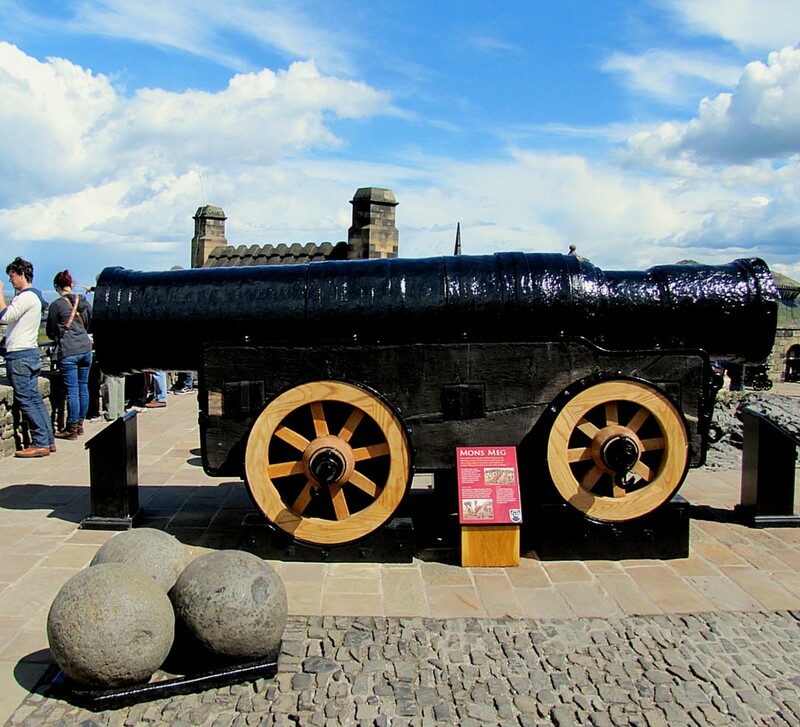 This is Mons Meg, a huge medieval bombard. It was transported using the wheels, but it would be dismounted and set into a trench in an earthworks to fire. It could lob one of those 330lb gun stones up to two miles. I looked around the other museums here, including the regimental museums. They had the standard captured by Charles Ewart at Waterloo, when he took the regimental colours and gold eagle from one of Napoleon’s regiments. The eagle, unfortunately, is on loan to the National Museum, so it wasn’t here. Then, on the way out, I saw this. So, I had this idea about climbing Arthur’s Seat. 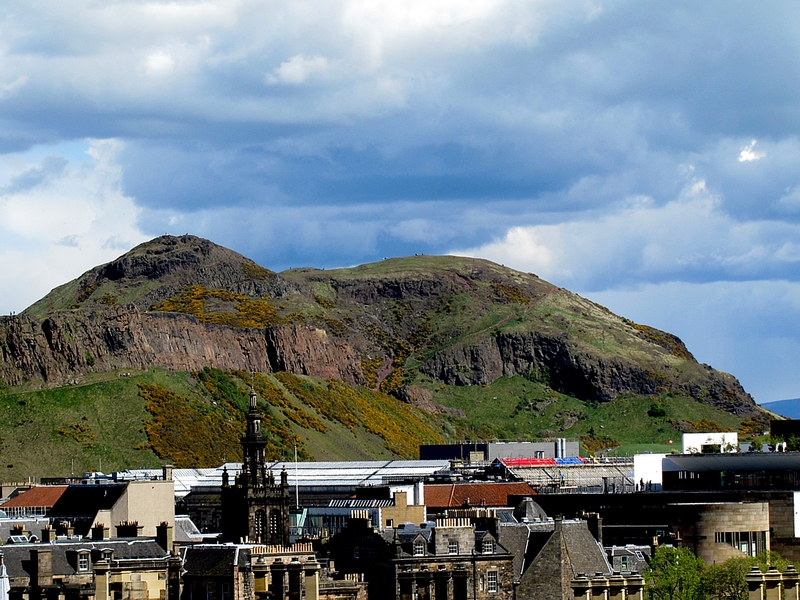 It’s a fairly smooth path up the Salisbury Crags to it, and it offers amazing views of the city. 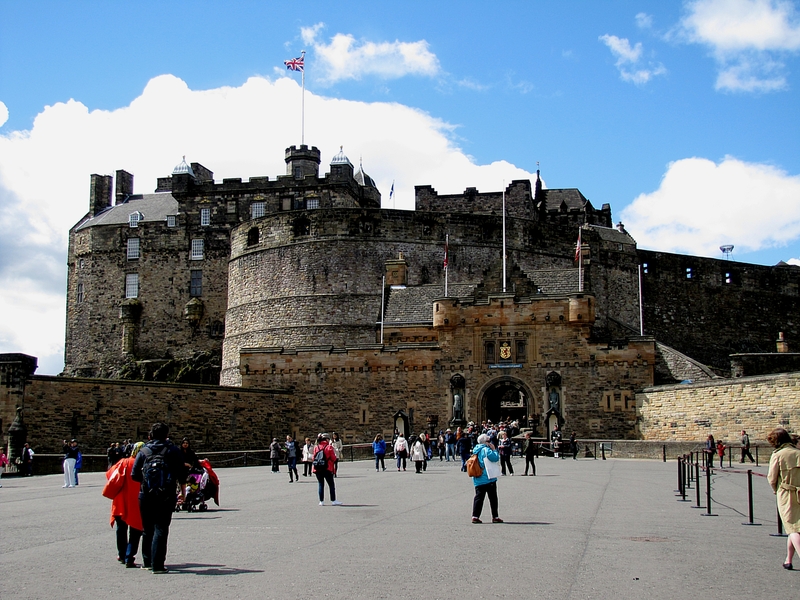 But here, I got a good look at the place from the parade ground of Edinburgh Castle, and nope, I don’t think I’m gonna be climbing that. I rode the sightseeing bus around to the start again, and then walked back to my hotel, stopping for some dinner. Tomorrow, I need to be up early. I’m on a tour up to the highlands, including Glencoe and Loch Ness. Today, I met up with my brother, Al; my sister-in-law, Daph; my nephew, Ryan; and my niece, Keira. 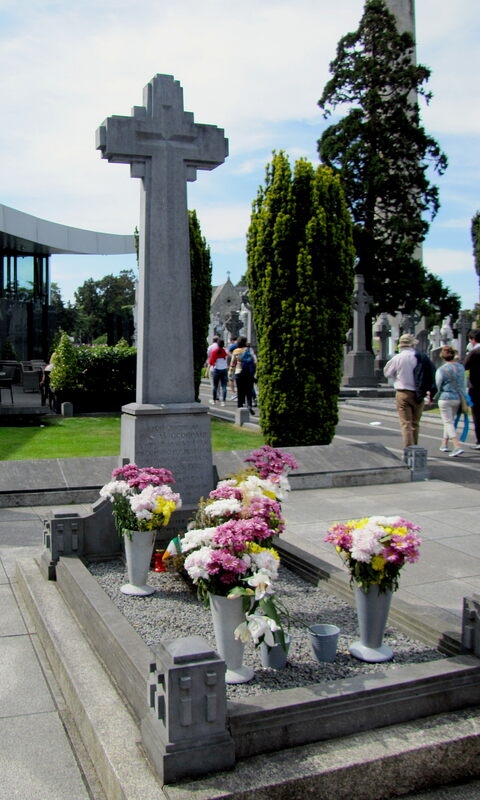 We got together at the spot on the north side of St. Stephen’s Green where the tour buses stop, and tried to get on a Viking Splash tour, but it’s a Friday, halfway through June, and a lot of school groups had booked the tours right up until 5:30. We decided to see how we were doing towards the end of the day, and maybe try and get on it then1 if we were up to it. So, instead we got on the City Sightseeing Hop On, Hop Off tour. 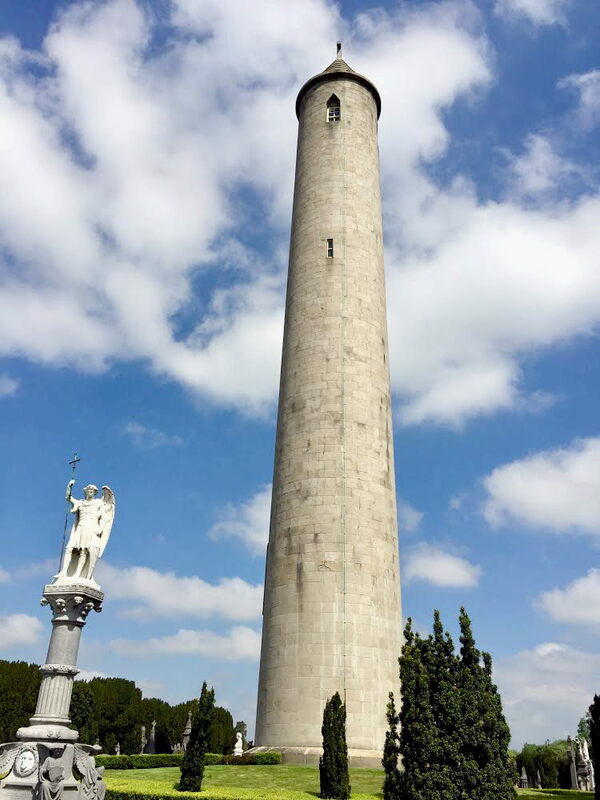 I had been predisposed towards them – there are two companies running these tours in Dublin – and the gentleman running the tour offered me a deal because I had gone on the City Sightseeing tours in Belfast. That made it an easy choice. 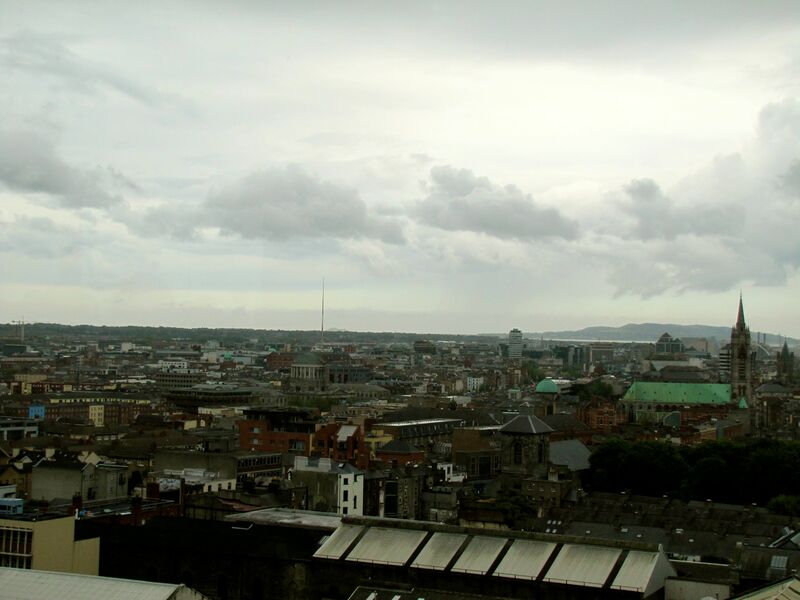 We were looking at three stops: Dublin Castle, Dublinia, and the Guinness Storehouse. But Dublin Castle was off limits today, due to some important heads of state staying there – I don’t know who, but it was probably connected to the G8 session starting up in Fermanagh next week. Dublinia, though, was open for business. Again, there were lots of school groups in there, but we were able to work our way around them. 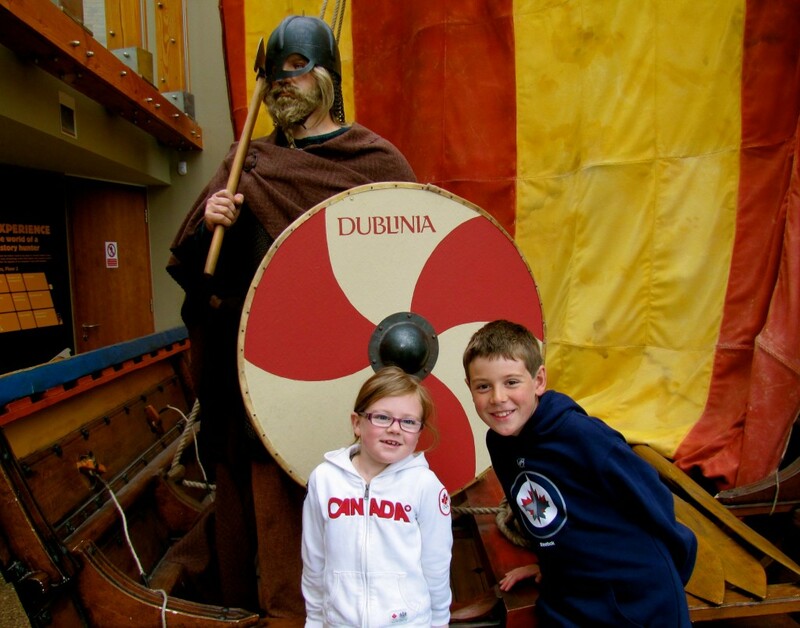 Dublinia is a wonderful little museum aimed at kids that shows Viking Dublin, medieval Dublin, and the way the information was discovered. 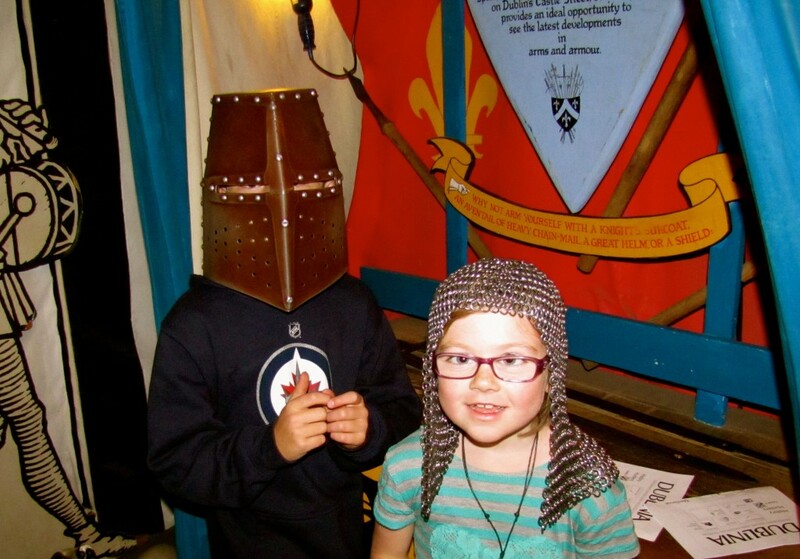 Among the things they have is a chain coif and a full helmet that kids can try on. 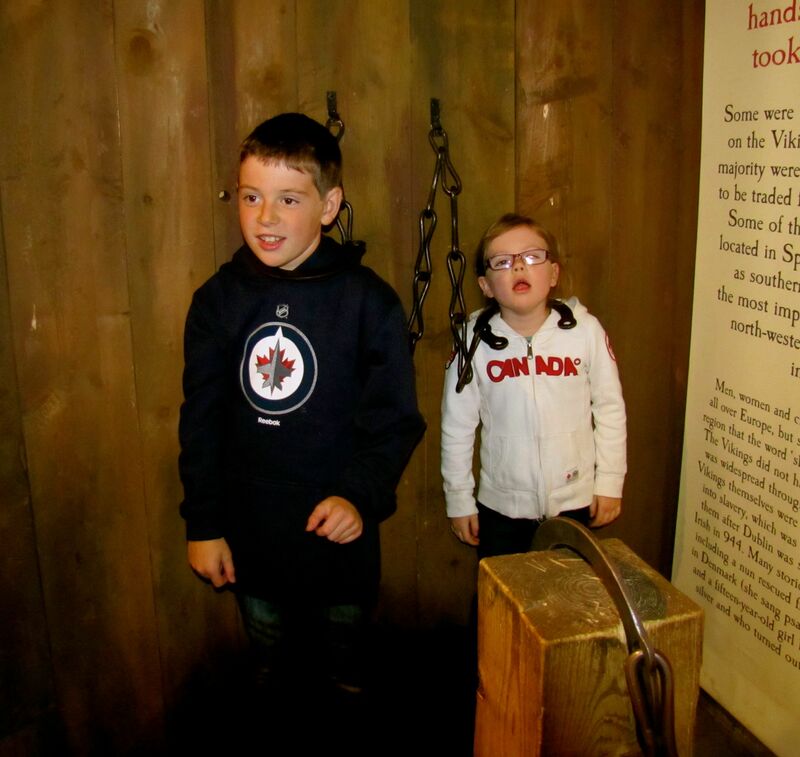 They also had some slave collars that the kids just had to try on. Keira made a new friend who led her astray. 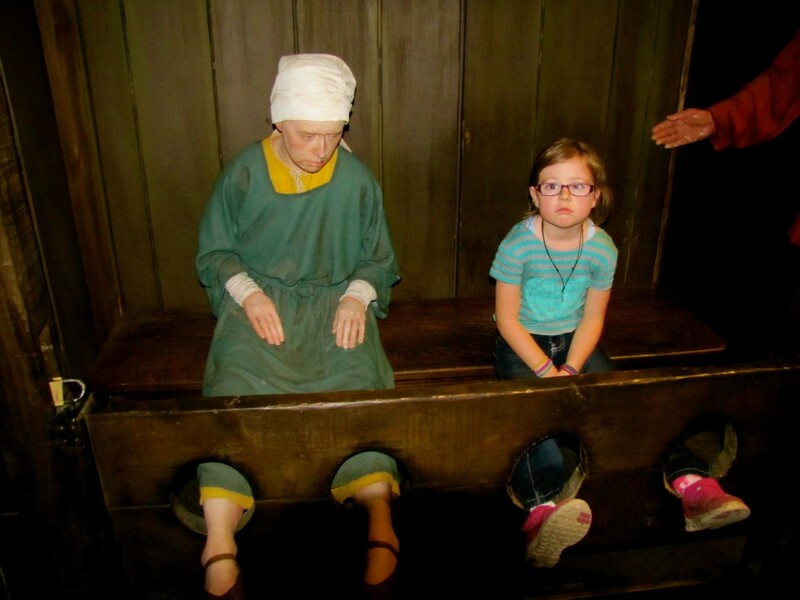 They both wound up in the stocks. 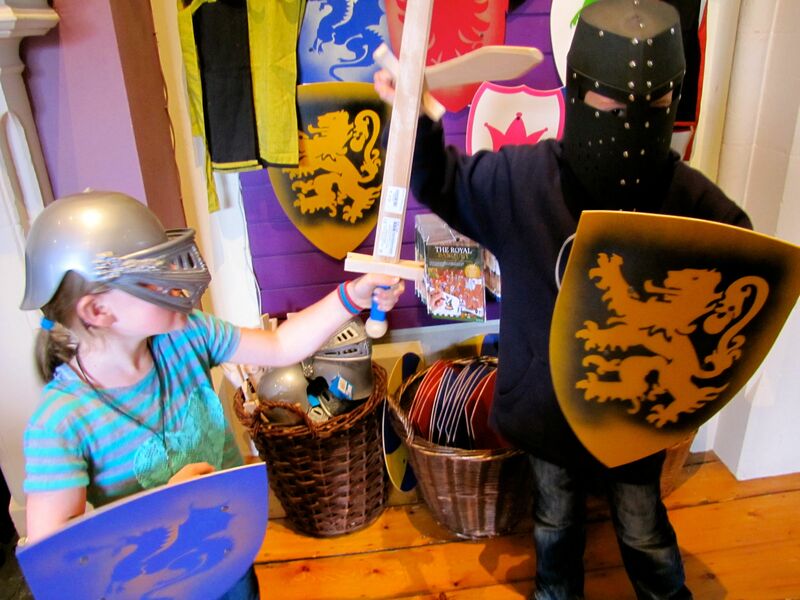 And, of course, there were helmets, shields, and swords in the gift shop, so the kids had to attack each other. The next place we went was the Guinness Storehouse. Al and Daph had gone on the tour about nine years ago, with a newborn Ryan on their backs. They had had a wonderful time, and were excited to go on it again. Have to say, we were all pretty disappointed. From what I understand, Guinness is no longer Irish-owned, but has been sold to the Italian corporation, Diageo. Al and Daph had described a tour rich in history and story, with lots of interesting facts and cool things to see and do. We all found that the tour was bland, uninteresting, and mainly focused on extracting more money from people. It was also incredibly crowded – we made it all the way up to the Gravity Bar, which was a pretty cool room, but Al and Daph didn’t even want to stay to have their “free”2 Guinness. Still, there were a couple of cool things. 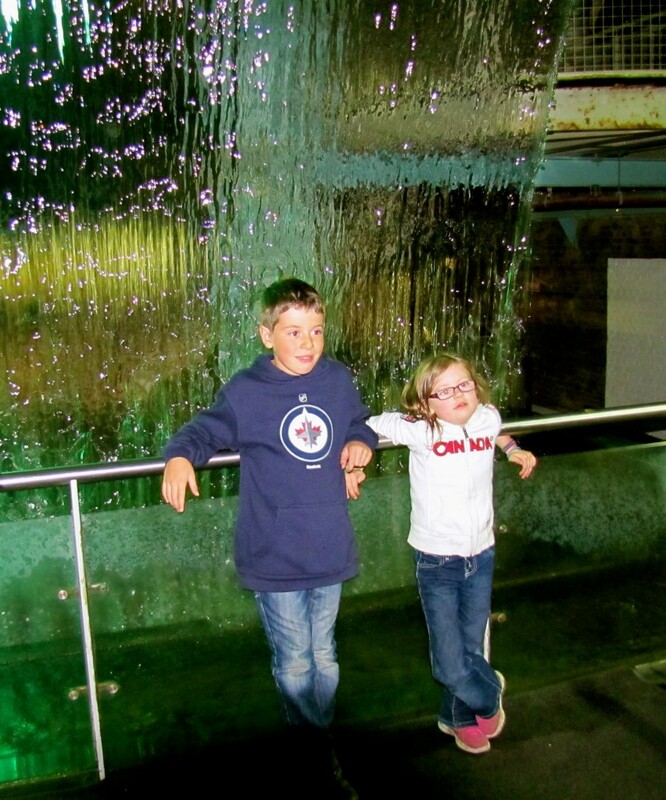 Here are the kids by the waterfall. They were fascinated by the fact that, in the water overhead, there were coins that were not being washed over the falls. This was kinda neat. 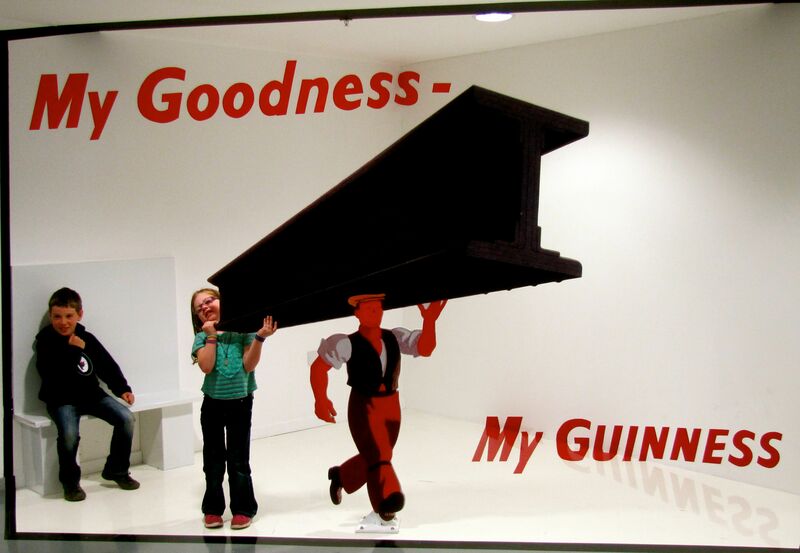 It’s a forced perspective room that lets you recreate one of the iconic Guinness advertisements. There’s a great view from the Gravity Bar at the top of the tour, but really, not worth it. And then we caught the bus back to Temple Bar, wandered a bit until we found someplace to eat, had dinner, and then I walked everyone back to Merrion Square for them to catch the bus back to where they’re staying. Have to say, it was a wonderful day. It was great to spend some time with the family, and lots of fun with the kids. So, thanks to Al, Daph, Ryan, and Keira for meeting me in Dublin, and hanging out with me for the day. I had an awesome time. Tomorrow is my last day. I’m getting back on the Hop On Hop Off bus, and I’ll try to squeeze in one or two other places I want to see. Then I’m back on the plane on Sunday.